Here at Lockaway Storage, we know our success is due to our wonderful team. The care they give our renters is unparalleled and we want to highlight their milestones along the way. 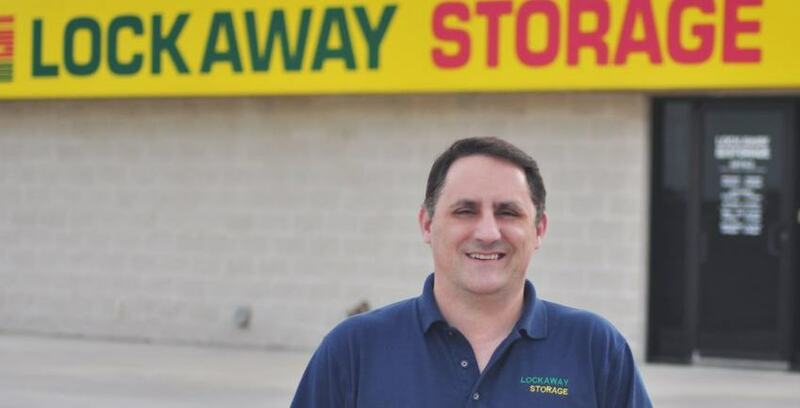 Below is an interview with San Antonio team member Jason Steitle, who is celebrating his 4-year anniversary with Lockaway Storage. Jason Steitle, Education and Training Manager for Lockaway Storage, outside of a Lockaway facility in December of 2018. Jason is the Education and Training Manager for Lockaway Storage. Peter: How many years have you been with Lockaway Storage now? We’re going on 4 or 5 now, right? Jason: It’s been 4 years. Peter: Wow, 4 years is a long time at any job. How did you get started with Lockaway Storage? Jason: Well, my family and I were looking to get into the storage business, but none of us really knew how to do that, so I thought I would get a job at a facility to try to figure out how to operate one, to see if our plans were even plausible at all, to see if it was something we could even do. When I got the job at Lockaway, I was an assistant manager. I thought I would only be here for a few months, so I could learn the business and, of course, that was 4 years ago. Yeah, kind of a different situation. I was blown away by the different people in the company. They have always made me feel valued and appreciated, which is part of our culture, so my plans changed. I have put my entire focus into staying long term with SPMI. Peter: That’s pretty unique that you had self storage in mind before joining up with Lockaway Storage. What about the business drew you to it? Jason: A friend of my sister’s started a very small RV storage place. They had purchased some land outside of town and it became so successful that she left her job. We decided that, as a family, it was something we were going to try, but we didn’t know how to get started. I figured I could learn from the inside and I haven’t left, so, haha! Peter: Yeah, that’s awesome! Is it what you thought it was going to be? Or was it surprising that the company culture was what it was? Jason: It’s way different. I can’t think of any company that is as large as we are that is so close. At the time, the CEO, Don, would come and visit us every month at the store level. You can just tell when he and Tristina walk in, they’re not typical, they’re not stuffy, corporate people. They’re real people, they are genuine. They care about our team members as people and that isn’t something you really find in a business that is the size that we are. Peter: Yeah, that’s for sure. You’ve really worked your way up from the bottom: starting out as an assistant manager, moving up to manager, then district manager, and now you’re the head of education and training for the company. Do you have any stories or memories that stick out from your time with Lockaway Storage? Jason: Yeah, I don’t have one favorite story in particular. One thing I didn’t realize when I first started is that there are stories. I had a misconception that storage was just about getting your Christmas decorations out of the attic or parking your boat someplace other than your driveway, because your homeowner’s association won’t let you have your boat in the neighborhood. Those situations are common. They do happen, but there are so many other things I hadn’t considered. There are a lot of people who use storage, because they are going through some kind of transition, some kind of crisis in their life and all of their stories are unique. The one common thread between them is that there is normally something stressful going on in their life and I hadn’t thought of that when I got into storage. When I first got hired, I spent a lot of time sometimes counseling them. I think one thing that makes lockaway different in these situations is that we really want to help our tenants through these difficult times and be there for them. Sure, we want to sell to them, but that is not our main goal when they have these kinds of life changing situations. We just want to meet their needs, so that storage is the least of their concerns. That kind of emotional connection with our customers never even crossed my mind before I got hired, that that would be something we would have to deal with on a daily basis. I think all of our managers would say the same thing. There are people where you just feel for the situation they’re going through and it’s kind of interesting that we can be there to help. Peter: That’s a great insight. I had not thought about that before. So, you’re not always working at the self storage facility. Do you have any hobbies the Lockaway team may not know about that you would like to share? Jason: I play golf and I play tennis and I go to Spurs games and Mission’s games, our minor league baseball team that we have in town. Those are pretty much my hobbies. Jason enjoying a San Antonio Missions baseball game in June of 2017. Peter: Ah, so you’re basically the man about town participating in sports and sporting events, just enjoying life? Jason: Yeah, I like playing sports and sporting events. There’s a golf course on the south side of San Antonio called The Republic. It’s by our W.W. White location, where I used to live. It’s usually not very busy, because it’s on the side of town that a lot of golf courses aren’t on. I really like that one. Peter: One of those off the beaten path, hidden gem, kind of places? I like it. How about food? Do you have any favorite restaurants in town? Jason: Haha, it’s pretty basic, but, haha, I hate to go with a chain restaurant, but I used to work at Outback Steakhouse for a long time and I still love Outback Steakhouse, so I know everything that’s on the menu, all the ingredients they have, all the secret items you can ask for and all of the things that aren’t on the menu anymore that they still have. I really like eating there. Peter: Haha, that’s awesome. I don’t see anything wrong with choosing a chain, especially since you know everything you can possibly ask for. Peter: So, I want to be respectful of your busy schedule. At the end of these, I like to ask if there is anyone at Lockaway or at the SPMI home office who you think deserves a shoutout. Is there anyone who has helped you out during the last few years that you think deserves a shoutout? Jason: A lot of people have helped me out over the years. The first shoutout has to go to Don and Tristina. They hired me in the first place and have supported me consistently with both things that have happened at work and things outside of work. They both have been very supportive. Ashley Montessoro and Misty Wehrer: they were great trainers. They trained me in the first place and they made what appeared to be an overwhelming job look very easy, because they are so good at it. I think Travis deserves a shout out, because he is helping us grow as a company. I know we can go to the next level and I know it’s a challenging position for him to be in. There are a lot of team members I’ve gotten to know on a personal basis that I call friends now. There are a lot of places you can work where you don’t make friends, but this is not one of them. I have a lot of people in my life who deserve a shoutout.